Vacuum vs. Mechanical Clamping: Which is Best? 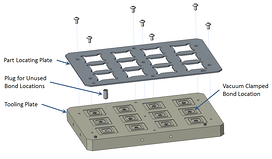 Whether you are placing components for die attach or creating wire bonds (ball or wedge), a good quality connection requires that the substrate surfaces be held firmly in place. Particularly for wire bonding, if the substrate is allowed to move at all, the wire will most likely fail to bond or will be poorly attached. There are many ways to clamp parts, but the methods fall into one of two categories: vacuum clamping or mechanical clamping. Vacuum clamping is typically done using the bottom surface of the part (the side opposite the bond surface) and mechanical clamping is typically done by pushing down on the top (bond-side) surface. Both methods have advantages and disadvantages, and there are several points to consider when deciding which method is best to use for a particular application. If the parts have bottom surfaces that are smooth and flat to within tight tolerances, vacuum clamping may be ideal. The larger the flat surface area available, the higher the force that can be created by vacuum, and the less sensitive the bond process will be to variations in surface flatness (a cause of vacuum leakage). Two major advantages to vacuum clamping are that the tooling is simpler, and the completed parts can be replaced with new ones quickly and easily—just turn off the vacuum to release the finished parts, and turn on the vacuum once the unbonded parts are in place. Part location can often be accomplished with simple pins or a locating plate that make part removal and replacement very quick and easy. A disadvantage to vacuum clamping, however, is that there is a limit to how many parts can be clamped at once. There will always be small vacuum leaks due to variations in flatness on the clamping surfaces, and additional parts increase the opportunities for leakage. Too much leakage can cause insufficient clamping. If many parts must be clamped at once, or if the parts are small and/or irregularly shaped, or if vacuum is simply not available, mechanical clamping is the best option. 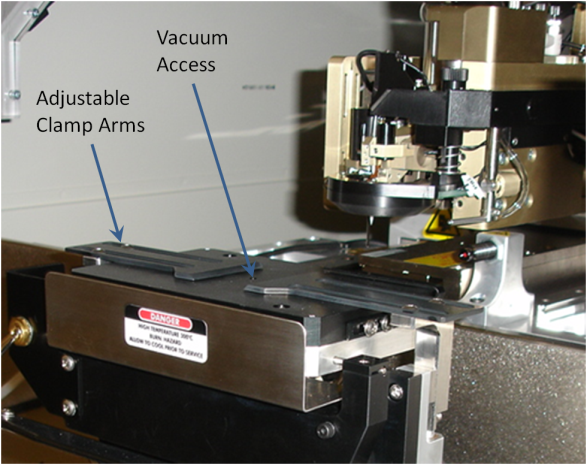 Mechanical or "top" clamping has zero risk of bond variation due to vacuum leakage or vacuum failure, and can often accommodate large variations in part geometry for those parts that have looser tolerances. Large clamping surface areas are not required, and the amount of clamping force can be more easily tuned to whatever value is required for the particular application. However, top clamping also has some disadvantages. There must be areas on the part’s top surfaces or edges which can withstand clamping forces without causing damage to the part. Also, the tooling can be more complicated, often having multiple pieces that must be disassembled to remove finished parts and reassembled to clamp down new parts. Although the additional complication is kept to a minimum, mechanical clamping can often require more time and effort to remove and replace parts than vacuum clamping. 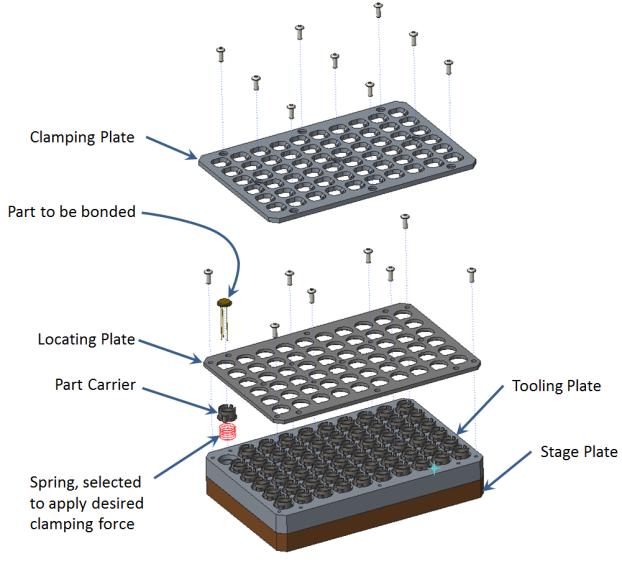 Which clamping method is best for bonding your parts depends greatly on the parts themselves. Palomar has a large selection of standard stages that can provide either vacuum or mechanical clamping (or both at once!) and can work for a wide variety of parts. If custom tooling is required, Palomar engineering has extensive experience clamping even the most complex parts and we will work closely with you to develop the best possible clamping method and tooling for your application. Contact us to discuss your organization's current needs, or if you have further questions on part clamping.